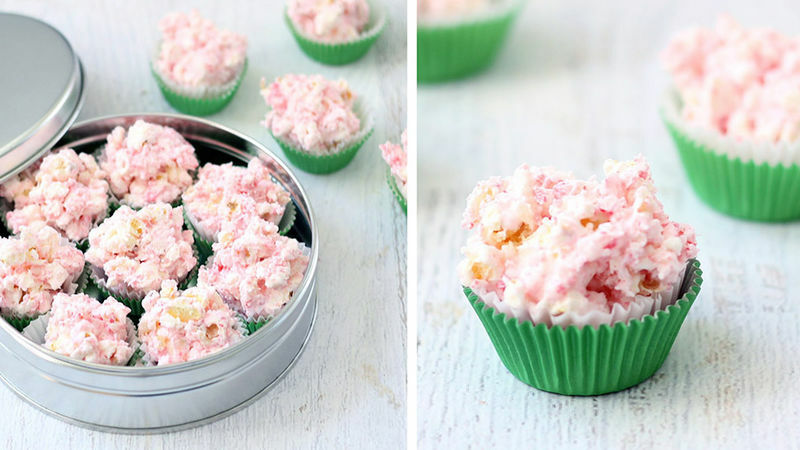 Line a mini cupcake tin with baking cups or spray tin with cooking spray. Set aside. Unwrap candy canes and place in a food processor. Process until candy is mostly ground. Alternatively, you can place the candy canes in a zip-top bag and crush with a mallet or rolling pin. Place popcorn in a large bowl and top with crushed candy canes. Place candy melts in a microwave-safe bowl with vegetable shortening. Microwave at 70 percent power for 90 seconds. Stir and continue to microwave for 30 seconds, then for 15 second intervals, until fully melted and smooth when stirred well. Stir in peppermint extract. Pour candy melt mixture over popcorn and candy canes and stir very well. Scoop about 2 tablespoons of the popcorn mixture into the mini cupcake tin. Gently press mixture with your fingers, rounding the top. Each baking cup should be just a bit over-filled with the mixture. Let mixture set at least 30 minutes before packaging or serving.